There’s a reason braids have never gone out of style – they’re easy, look good, and won’t cause breakage. Braids are amazing for keeping your hair out of your face while still looking put-together, and we’ve rounded up 10 of the best braids for this fall. Fishtail braids look amazingly cool but take minimal effort — they are actually really easy to do! The simplest way to do a fishtail braid is to divide your hair into two big sections. Take a small handful of hair from the first section and bring it across to the second section. Repeat using the other section of hair, and tie with a hair elastic at the end. Loosen the strands of the braid if you want a more voluminous look that’s less tightly woven. There are a number of spins on the classic fishtail braid that you can take: You can French braid your fishtail braid (as shown), do two fishtail braids, or even do a half-up, half-down look with one small fishtail braid down the middle of the back of your head. This hairstyle has been very popular this summer thanks to celebrities like Kim Kardashian, but it would also make the perfect fall hairstyle. Double braids look especially cute under a beanie, but you can use any hat that you love. You can even go full-on ‘Formation’ and wear a wide-brimmed hat on top of your braids like Beyonce. This is a braid style you can do with any hair texture. First, make sure your hair is parted down the middle. Next, create a small braid on the side of your head starting near your part, and slowly add hair to the braid. Make sure you eventually incorporate all of the hair on the side of the part into the braid and finish with a hair elastic. Do the same for the other side. To add extra volume to your braids, use a volumizing powder on your roots and loosen the braids with your fingers. This braid is another versatile style that can be worn by anyone with straight or curly hair. You’ll want to take a small section of hair from one side of your head and braid it up over and across your head, as opposed to down the side like you would normally braid. This might take a little bit of trial and error. Once you’ve completed the braid and secured it with a bobby pin, take another section of hair from the opposite side from where you started and start braiding towards the other side of your head and secure. If you can, try to hide where you’ve bobby pinned your braids underneath the start of the braids on each side. You can make your crown braid as close or as far away from your hairline as you want. 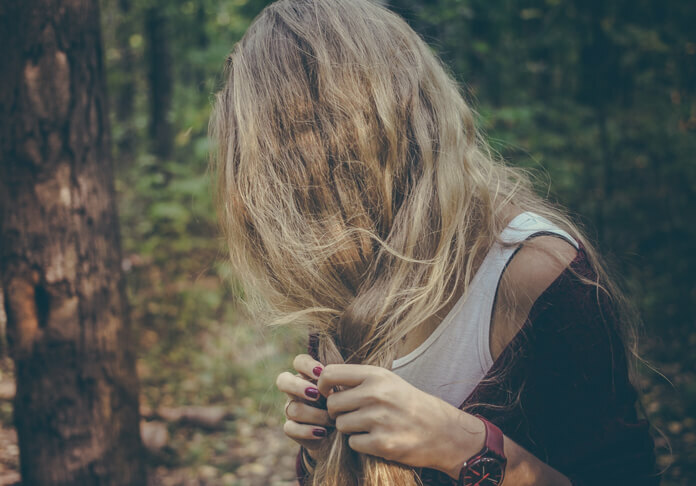 An easy way to keep your hair out of your face and still show off some length is to take two sections of hair on either side of your head and braid them sideways towards the back of your head. You can either keep them separate or join them together, securing with bobby pins, clips, or an elastic. You can make the braids as thin or as thick as you want; just make sure they are even on both sides. You can leave your hair down, or you can throw it into a ponytail, as shown. To achieve this look, you’ll need some hair elastics and a scarf about the same length as your hair. First, tie your hair into a simple ponytail. Thread the scarf through the elastic and braid it as if it were the third section of hair. Secure the end of the braid with another elastic, and twist the braid into a bun. Keep the bun intact with either another hair elastic, a clip, bobby pins, or any combination of the three. Alternatively, leave the braid down for a pretty ribbon braid look. For this beautiful braid, you’ll need to perfect your French braiding skills. All you need to do is create a French braid starting from the base of your neck until you reach the top of your head. Secure the remaining hair into a bun and loosen the braid. You don’t have to learn a complicated new technique to get this braid — it’s all about the bobby pins! Small pins work best for this hairstyle, but you can try with normal-sized ones too. All you need to do is create two Dutch braids on one side of your head. The difference between a Dutch braid and a normal braid is that the strands go behind the middle section, not in front. Once you have your two Dutch braids, loosen them so that they appear to have more volume. Then, place them together so that they look like one big braid. You’ll need to use plenty of bobby pins to make sure they don’t move. Lastly, use a hair tie at the bottom of the two braids. You should have a gorgeous, thick mermaid braid! Now that you know how to make a fishtail braid, you can put your skills to use and create a fishtail braid bun. To get this look, tie your hair in a ponytail and create a fishtail braid. Next, loosen your fishtail braid liberally. You’ll want to do this to get as much volume as possible. Then, wrap the braid in a circular formation on the top of your head and pin. Unlike the crown braid in number 3, this Dutch braid goes around the back of your head. Start your Dutch braid wherever your part begins, braiding vertically across your head. Pin your braid tucked under a piece of loose hair. For this braid you will need a handful of hair elastics. Start by creating a ponytail on one side of your head. Then, take the hair above the elastic and divide it into two sections. Twist the two sections as shown, and secure another elastic a couple inches below. Repeat the process until you have as many sections as desired.